It’s always such a treat when I get to have macarons. These are perfect are a great option for parties because they are naturally Dairy-Free and Gluten-Free. In large bowl, sift together the almond flour, and powdered sugar three times, making sure there are no lumps, and the mixture is even in color. Mix in the 105 g of egg whites and contents of vanilla bean pods. Continue to mix until a dough like consistency is reached. Set this mixture aside. Put 110 grams of egg whites in the bowl of a stand mixer. In a small pot, whisk together the sugar and water. Clip a candy thermometer into place, and start heating the sugar mixture. Once the thermometer has reached 220 F (105 C), start you stand mixer on medium high. You’re goal is to have your egg whites at the soft peak stage at the same time the sugar mixture reaches 239 F (115 C). Once the eggs have reached the soft peak stage, reduce the mixer speed to low. Precisely when the sugar mixture reaches 239 F (115 C), take it off the heat and carefully pour it into the whisked eggs. Pour the sugar right where the eggs meet the side of the bowl. You do not want to pour the mixture on the side of the bowl, otherwise it will crystallize, but you don’t want to pour into the center of the eggs, or you run the risk of cooking your eggs. Once all the sugar has been added, turn your mixture up to it’s highest setting, and beat until you have stiff glossy peaks. Once the mixture is the right consistency, transfer it into a pastry bag with a 1/2 inch pastry tip. 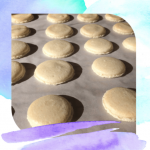 Pipe the macarons straight up and down onto pans lined with parchment paper. Once you have piped all the cookies, let them set on the counters for 20-30 minutes. Preheat the oven to 350. The cookies are ready to pop in the oven, when you can poke them, without your finger sticking to them. Bake for 12 minutes. Once the cookies are done slide the parchment paper off the cookie sheet, and let rest for at least 5 minutes. Gently peel each shell off the paper, and match with an equal sized partner. Let the cookies cool completely before filling with your favorite ganache, icing, or chocolate filling, for this recipe I recommend using this recipe for fluffy brown sugar icing, but replace the vanilla extract with real vanilla beans.